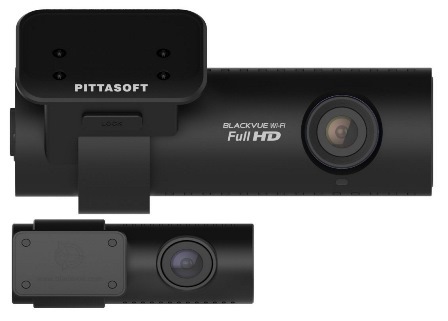 The Pittasoft BlackVue DR650GW-2CH is a dual channel dash cam with WiFi capabilities which is an update of the DR550GW-2CH. This dash cam comes with GPS, G-sensor and parking mode. The camera is based on the HiSilicon Hi3516 processor and Sony Exmor CMOS sensor (front camera). Both cameras are small with the front camera measuring 118.5 x 36mm and the rear camera measuring 67mm x 28mm. The front camera records at 1080p but the rear camera only records at 720p which is disappointing since numerous dual 1080p cameras have been released. While the size and features are very attractive, the biggest drawback is the video quality. The front camera has very good video quality during the day and average video quality at night. While the video quality for the front camera is slightly better than the DR550GW-HD it is not a dramatic improvement. Blockiness / pixelation still occurs in some settings. The rear camera is average at best. One of our members USDashCamera, did a video review of the camera. Higher bit rate – Low bitrates has been a common theme with BlackVue cameras but have improved slightly with the DR650GW-2CH. The front camera has a bit rate of 8.5Mbps (previously was 6 Mbps) and the rear camera has a bit rate of 3 Mbps (previously was 2 Mbps). Unfortunately this is still quite low and pixelization / blockiness still occurs in some settings. Black Case – With the exception of the “BLACKVUE Wi-Fi Full HD” logo, the entire case is primarily black. The silver ring around the lens and the grey ring on the camera mount are gone making this camera more discreet. New coaxial cable – The coaxial cable connecting the front and rear cameras is available in 6m, 10m or 15m and is also thinner. The thinner cable can easily get damaged so be careful when installing. A damaged cable may result in no picture / poor picture quality from the rear camera. Firmware Over The Air – Firmware can be updated automatically via Wi-Fi if you have the app on your phone. Some users have complained of a random color problem for the rear camera. This typically happens when the camera operates in high temperatures. This video demonstrates the problem. There is no known solution. One complaint we have heard a few times is that the camera records a purplish tint on the right / left side of the camera as shown in this video. This is likely due to a poorly adjusted white balance and may be corrected with a firmware update. Some owners have complained that this camera interferes with Digital Audio Broadcasting (DAB) radio. This is typically due to the cable connecting the front and rear cameras and how it is installed. Repositioning the cable has helped reduce the problem. Some owners have added a ferrite core to reduce the problem. These may or may not work in all cases. The design and features for the BlackVue DR650GW-2CH are excellent. However the macroblocking / pixelation and purple tinge problem are disappointing. This camera has just minor improvements over the DR550GW-2CH, but the price tag is significantly higher. If you like the form factor and features, we suggest saving a few dollars and purchasing the DR550GW-2CH since the differences are small. Alternatively, take a look at some of the dual 1080p cameras which are being released in late 2014 / early 2015. This camera is available on eBay and Amazon for approximately $400. You can download the manual from the BlackVue site. Final Word A feature packed camera but we suggest saving a few dollars and purchasing the DR550GW-2CH since the differences are minor.